There was an explosion outside our house on Monday night, a quiet glorious explosion courtesy of Mother Nature. Stepping from our cool, shady abode into the endorphins-prodding, warm March sunshine we were treated to a floral ballet as the previously slumbering buds of our orchid tree had bloomed and now danced their way along bowed branches in delicate shades of perky pinks and silky soft whites. Almost touching their bent bows was the shaggy, overgrown jasmine hedge swathed in white stars so bright it was probably safer to view them through sunglasses. 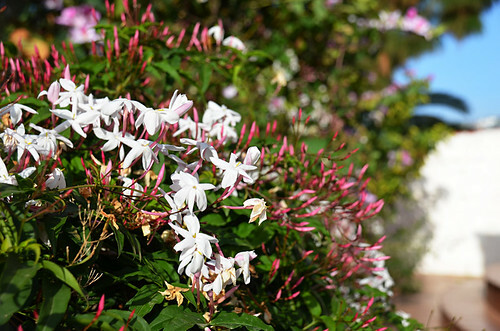 The added treat with this jasmine display is come sundown, they release a scent which perfumers would sell their soul to capture in a bottle. The floral awakening was greeted by an avian version of a battle of the bands as a troop of Canaries did their best to out-perform the sweet, lilting song of our favourite solo artist, the capirote. 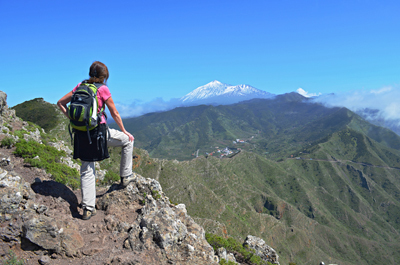 The advent of spring; our favourite time for walking in the Tenerife hills, or the hills of any of the greener Canary Islands for that matter. 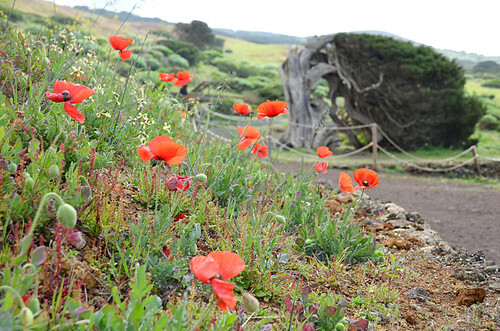 A couple of weeks ago we saw an advance party of wild poppies on El Hierro. To wander lonely as a cloud that floats on high o’er vales and hills in the hope of spotting a host of if not golden daffodils then scarlet poppies and their amigos, you have to choose which hills and vales to wander over. These are our three favourite areas for spring wild flower spotting. 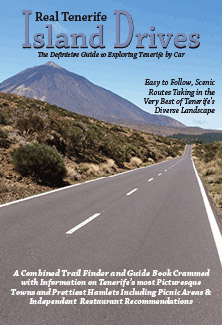 The lands around Santiago del Teide are on the greedy side when it comes to floral displays. In January/February they hog the limelight with displays of almond blossom which draw an army of walkers. 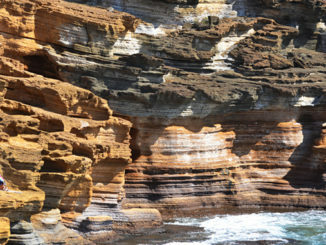 In spring, green verges and what passes for fields in these parts become a gently swaying sea of green, scarlet, yellow and even blue with red tabaiba adding its exotic wine-coloured beads to the mix. 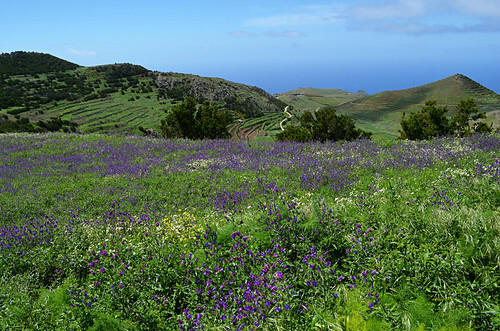 The west is a colourful hunting ground for wild flowers. 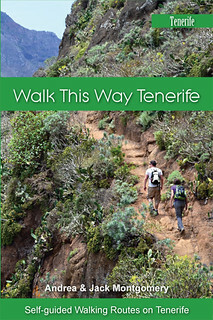 Climb from the El Palmar Valley to the slopes overlooking Tenerife’s most westerly point at this time of year and you should be treated to displays which include flowering wild fennel, lilac bugloss carpets and elegant asphodels, a member of the lily family used in some Harry Potter spells. 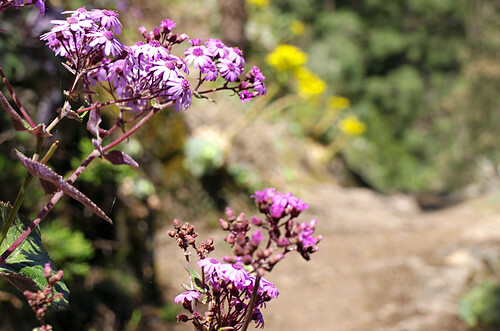 In the upper Orotava when trails escape the pines you find yourself walking through a more colourful world which can include violet bindweed, lilac daisies and thick bugloss (tajinaste) candles of varying shades alive with busy bees. 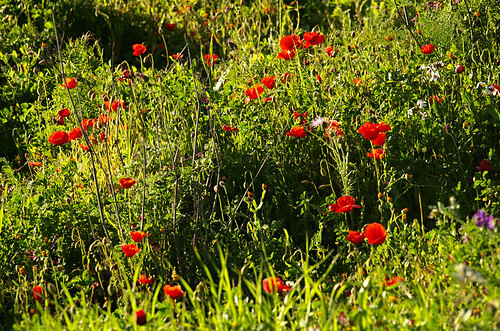 In country lanes around Aguamansa lavender coloured corn poppies dance with scarlet ones whilst jasmine and fuchsia flowers tumble over dry stone walls. 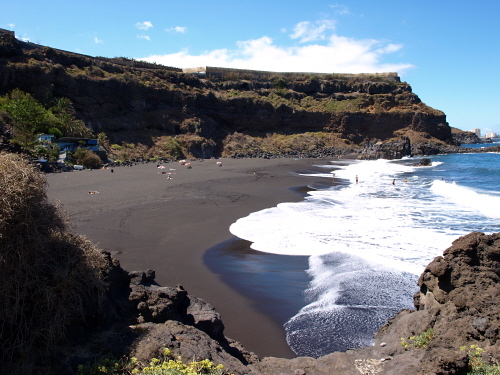 Tenerife and the Canary Islands are often referred to as the islands of eternal spring which means the islands enjoy year-round good temperatures (far warmer than many destinations’ actual spring temperatures in reality). However, when you’ve walked their woodland paths and centuries-old merchants’ trails during every month of the year you know that it’s not an entirely accurate description where flowers are concerned. 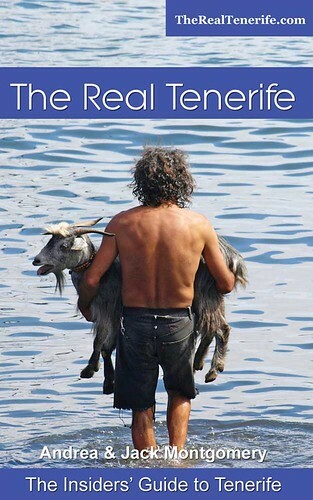 Spring on Tenerife is different, it’s special.